Home » Collection » Wall Drawing No. 681 C / A wall divided vertically into four equal squares separated and bordered by black bands. Within each square, bands in one of four directions, each with color ink washes superimposed. Wall Drawing No. 681 C / A wall divided vertically into four equal squares separated and bordered by black bands. Within each square, bands in one of four directions, each with color ink washes superimposed. Mr. and Mrs. Herbert Vogel, New York, NY; gift to NGA, 1993. From Minimal to Conceptual Art: Works from The Dorothy and Herbert Vogel Collection. Exh. cat. National Gallery of Art, Washington, 1994: no. 52. Ellis,Estelle, Caroline Seebohm and Christopher Simon Sykes. At Home with Art: How Art Lovers Live with and Care for Their Treasures. New York, 1999: repro. 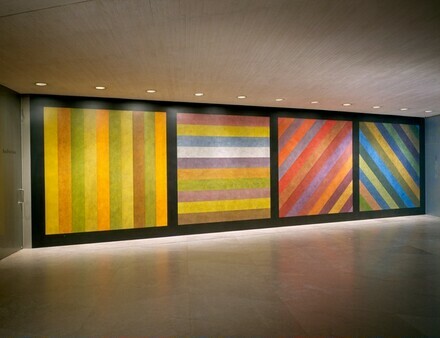 Sol Lewitt: A Retrospective. Exh. cat. San Francisco Museum of Art, San Francisco; Museum of Contemporary Art, Chicago; Whitney Museum of American Art, New York, 2000-2001: 4-5.